On the day I baked M. F. K. Fisher’s War Cake (below) to fortify my culinary literature students working on their final papers, a former student stopped by my office to give me a lovely loaf of cinnamon raisin bread. Better to receive than give, in this case! 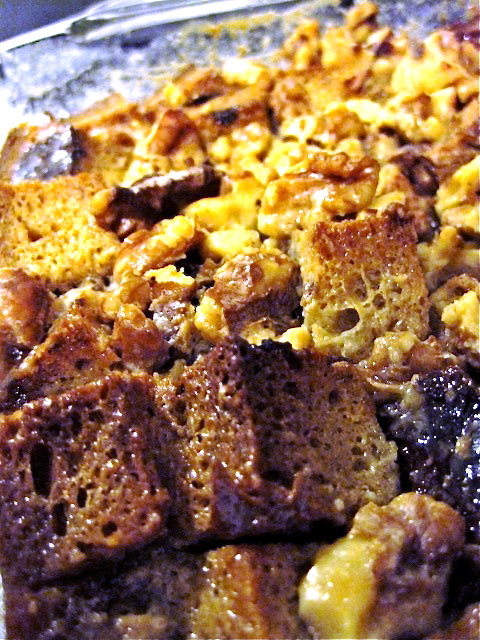 I turned it in to a simple bread pudding with cream and walnuts (above). Fisher’s War Cake is a coffee cake-style sweet loaf with raisins cut into pieces to resemble currants. 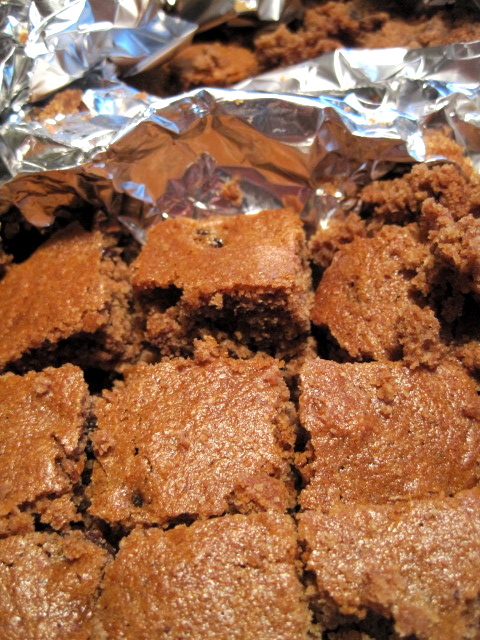 She adapted it slightly from popular World War I ration-friendly cakes that she had eaten in her childhood. I found one almost identical recipe in Amelia Doddridge’s propagandistic cookbook, Liberty Recipes (1918). The name of the cake in that book — Eggless, Milkless, Butterless Cake — kinda gives you the idea of the studied joylessness with which Doddridge crafts her recipes. The first step, boiling shortening and sugar together with the raisins and spices, softens the fruit. Even renamed the slightly less bleak War Cake, this is not Fisher’s finest moment. Without any binding agent, the cake crumbled to bits when I tried to cut it. Luckily, I teach kids forced to eat dorm food, so they didn’t mind eating the crumbs. I substituted currants for the raisins and used local whole wheat flour for a bit more flavor, but held off as hard as I could and didn’t add nuts or butter, even though I was sorely tempted. And I felt pretty bad that the class before mine had a giant box of Safeway donuts for their last week treat. War, huh, yeah. But back to that raisin loaf. My plan was to serve the pudding with some homemade crème fraiche and brandied apricots, but I realized I must have drunk myself into forgetful oblivion with the last of the apricots when I was on that bender a few weeks ago. The crème fraiche stubbornly refused to set up during the day, too, so we ate the pudding with slightly sour cream and some rather deliciously fizzy and/or possibly poisonous apricot-brandied cherries. 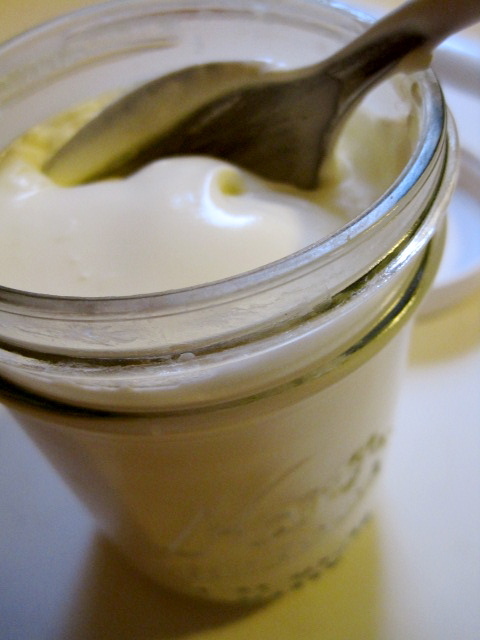 The crème fraiche, by the way, had set up beautifully by the time I woke up this morning, and it was amazing with leftovers. I strongly recommend making your own. Next Article pickled cheese? czech. Do you have recipe for your bread pudding? @marco rodriguez Click on the phrase “bread pudding” for the link to a recipe.